Earlier this month, on the 2nd of February, we again celebrated the birth of the Cape wine industry. On that date, in the year 1659, the Dutch Commander at the Cape, Jan van Riebeeck, wrote in his diary that the first wine was made from Cape grapes for the first time. And they still call South Africa a New Wine World country! 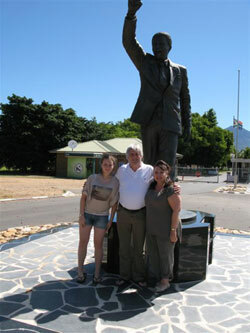 The Exley family, Chris, Lesley and Francisca, at the Nelson Mandela statue at the Drakenstein Prison. Chris later wrote that it was a "perfect day in all aspects, except for the pinotage". Due to the visit being on the 31 st of December with wineries closing early, we never got to taste the Pinotage which he so much wanted. Next time Chris!! On this day, 331 years later Pres. FW de Klerk made his speech in parliament, announcing what was to lead us to the unbanning of the ANC and the release of Nelson Mandela. I had the good fortune to have taken visitors of mine on that specific day to the Drakenstein Prison from where Mandela was finally released, and where there is an amazing statue of him, as well as to Groot Constantia, which is the oldest wine farm still in existence in the Cape. Admittedly, we happen to know that the first wine was not made at Groot Constantia, but it is nice to give this exceptional wine estate due recognition. It always impresses visitors with its neatness, cultural value, architecture, and of course also the quality wines, with the Sauvignon Blanc my clear favourite! Perhaps it is here that I should mention that my wine tours quite often lead my guests to places you don't expect to see on a wine tour. My most favourite of course, is the historical centre of Stellenbosch with its oak-lined streets, or Delaire with its wonderful collection of South African art, or the Rupert Art Museum in Stellenbosch, or a hike through the fynbos at La Motte, or the campus of the University of Stellenbosch. The diversity of the area, combined with my own interest in different aspects of cultural life, make such versatile tours and visits possible. The harvesting season has started and the ladies at Kanonkop sort the berries of the first load of Pinotage that has come into the cellar. 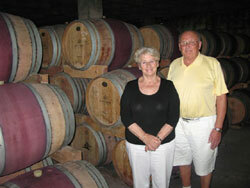 Dennis and Marianne Thoy in the barrel fermentation cellar of the Kanonkop Wine Estate. 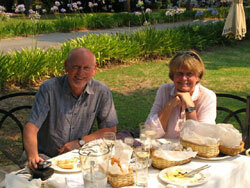 David Meyers and Sally Donlevy enjoying La Picnique on the Boschendal Wine Estate, an old favourite of mine. Similarly, the early grapes are also those used for brandy production. Although we don't see many of those in the Stellenbosch region, the process can be viewed at the Van Ryn Brandy Cellar, also just outside Stellenbosch. 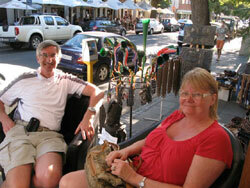 Tony and Cathy Coughlan had to be taken to the airport for their return flight, and there for we could spend some time in the streets of historic Stellenbosch. Andrew Mountford and his fiancée Debbie Angus came for a wedding of friends, and felt they should be more knowledgeable on the area before the event. 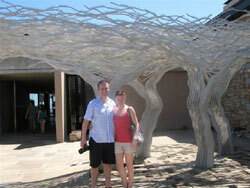 We also visited the Tokara Estate and they were pictured in front of one of the art works on the estate. I've been pretty busy since the beginning of the harvesting season, and will be till the end of March. It is as if travelers instinctively know that the winelands is the place to visit this time of the year. 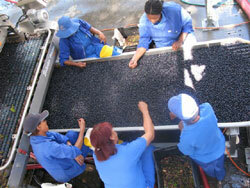 The harvest looks exciting and producers are very happy with what they have seen up to now. However, it is not only the harvest that excites us this time of the year. It is as if wine estates are competing amongst themselves to generate the most excitement. I've been contacted by a French TV team who wants to establish why South African wine tourism is so successful to the French version. I hope to report more on this in my next newsletter as I know what I will be telling them, which will basically be all about the effort that our winemakers make to draw visitors. There are festivals, shows and performances happening everywhere throughout the industry in the late summer months. Valentine's Day has come and gone, but kept scores of young people on the move with a wide diversity of events. U2 and Neil Diamond will shortly create huge interest in Cape Town, but out in the country we are having a ball with events like the Spier Wine Harvest Festival (www.spier.co.za), the Waterford Harvest festival (www.waterfordestate.co.za), and on Muratie a whole range of performers will be doing their thing. (www.Muratie.co.za) In Stellenbosch a festival called the Woordfees, (Word Festival in English), will take place in early March with more than 270 events, and over Easter Weekend a whole new programme will be staged again. What a wonderful time to be in the Winelands of the Cape!